Jambeaux, everyone!!! Harambe! On our show this week, we welcome back two very special guests, Aimee and Andy. and we are talkin’ about Moana and Sexism! It’s a movie review! On today’s show, we have Danny, Kevin, Eli of www.ivorycomics.com, and Lee of magicalmomentsvacations.com. We are joined by Aimee and Andy. For The Hub topic this week, we are talkin’ about Moana and Sexism with Aimee and Andy. It’s a movie review! Moana is a Walt Disney Animation feature released on November 23, 2016 in the USA. It came out just in time for the 2016 holiday season. From IMDB: “In Ancient Polynesia, when a terrible curse incurred by Maui reaches an impetuous Chieftain’s daughter’s island, [Moana], she answers the Ocean’s call to seek out the demigod, [Maui], to set things right”. In the course of our discussion, we entertain the topic of sexism in Disney animated movies. We know the pendulum has been at one particular end throughout the years. But, we are wondering if that pendulum has completely swung to the other side today. Would you bring your son to watch this movie? Would you bring your daughter to watch this movie? This is definitely on our bucket list…after Tokyo Disneyland and DisneySea, of course. 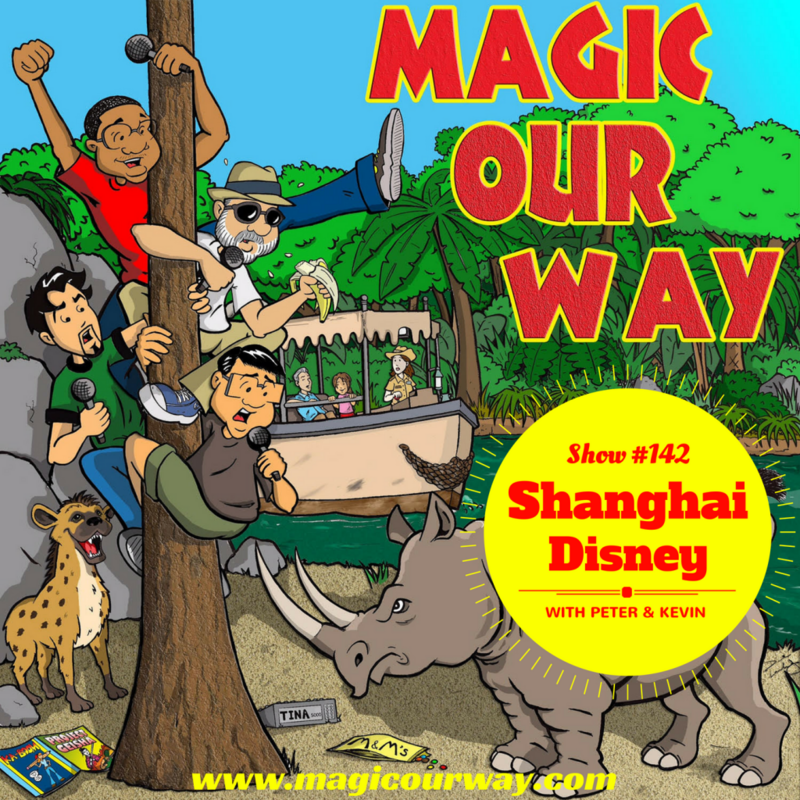 Listen to a first hand account of two Disney fans as they venture to the Walt Disney Company’s latest theme park offering, the Shanghai Disney Resort. Greetings. I hope this show finds you well. Welcome to this special edition of the Magic Our Way podcast. Today, we present our Thanksgiving special episode for 2016 with special guests Keith, aka Listener X, and Sean, Chief Woo Woo of the MOWican Nation. We are a New Orleans based Disney fan podcast. Thank you for listening to our show and we hope it brings a smile to your face. Your feedback is appreciated and we are committed to listening to our audience. On today’s show, we have Kevin, Danny, Lee of magicalmomentsvacations.com, and Eli of www.ivorycomics.com. For this special edition of the Magic Our Way podcast, we are talking about Thanksgiving in Walt Disney World. We bring back one of MOWicans and past guest, Keith, aka Listener X. There is a reason Keith chose @Disneythanksgiv as his handle on Twitter. Thanksgiving and Walt Disney World are one in the same for Keith and his family. Keith and his family have traveled to Walt Disney World for Thanksgiving for the past two decades. Keith has numerous insights and tips on how to celebrate this holiday when visiting the parks. He has done this on property as well as off property. Jambeaux, everyone!!! Harambe! On our show this week, we have two very special guests, Peter and Kevin, who are talkin’ Cast Member Stories! For The Hub topic this week, we are talkin’ about Cast Member Stories with Peter and Kevin. Peter and Kevin are two friends/co-workers with Danny’s dad who just happen to be major Disney fans as well. On this episode, they talk about their time as Cast Members in Walt Disney World. One was in food service and the other was a friend of…well, you’ll just have to listen to find out. There will be stories that will make you laugh and stories that will make you cry. But, in the end, you will have a better understanding of what Cast Members experience on a day-to-day basis in order to bring us the “magic.” So, thank one today! To learn more about the show, visit http://magicourway.com. Leave a VOICEMAIL or send us a TEXT at 1-815-MOWICAN (669-4226). Give us a listen, ya’ heard! Click the link to listen now. Jambeaux! Harambe! Welcome to this special edition of the Magic Our Way podcast. We are a New Orleans based Disney fan podcast. We appreciate your listening to our show and taking the time to allow us to discuss our thoughts. We also appreciate your feedback and are committed to listening to our audience. This is our second episode of the Best of Magic Our Way series of shows. On today’s show, we have Kevin, Danny, Eli of www.ivorycomics.com, and the very beginnings of Lee’s interaction with the show. 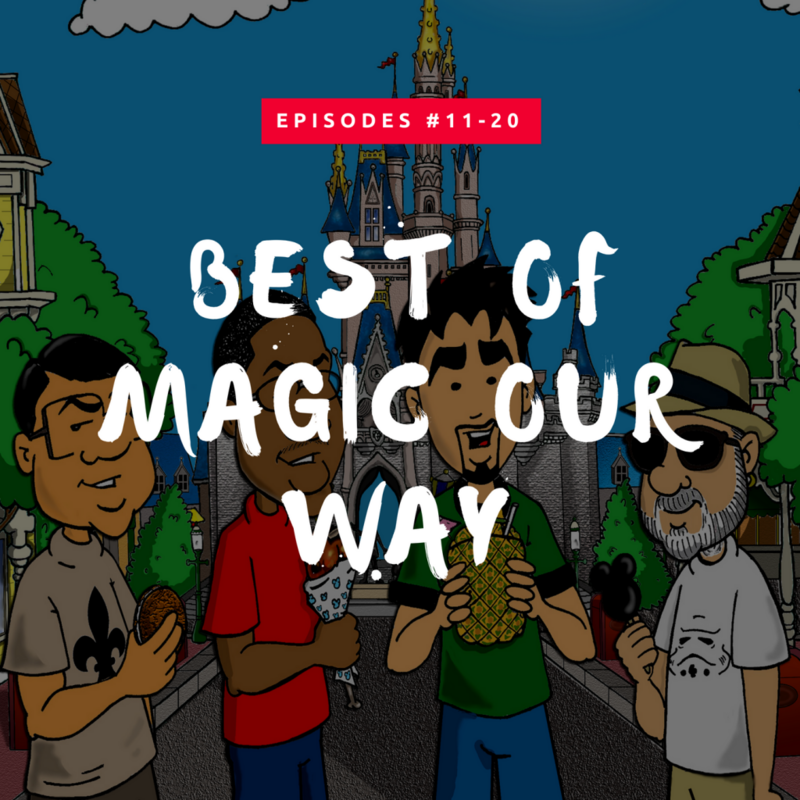 This is our second Best of Magic Our Way episode. This particular show will present some jovial moments and some origin stories from episodes #011-020, which is currently unavailable on iTunes due to their restrictions on the max number of shows it presents to its customers. When Magic Our Way first started, it was a two-man show with just Danny and Kevin. On this episode, you hear Lee’s first interactions on our show. You hear Danny and Kevin acknowledge Lee’s first email to us as well as read his iTunes review. Before he became a part of our show and the official travel agent of the Magic Our Way podcast, Lee was the very first MOWican. Jambeaux, everyone!!! Harambe! It is our Halloween Special for 2016. We are discussing Walt Disney World VIP Tours with our very own superfan, Dr. MoWHOcan aka Leisa Mundy. Dr. MoWHOcan and her family went on a VIP Tour of Walt Disney World and we discuss all of the ins and outs of her experience, everything from cost to what she did and how she did it. Because we are a show that likes to examine lists that people release, we compare Dr. MoWHOcan’s experience on the VIP Tour to this list entitled “5 Great Reasons to Book a VIP Tour at Disney World” which was published on May 23, 2016.